Where: The Grand Wayne Center, Fort Wayne, Indiana. part of this special event. 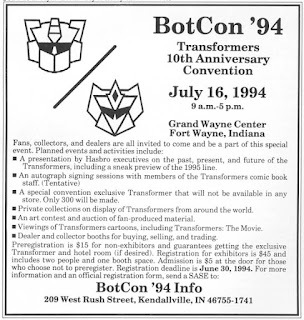 Planned events and activities include:* A presentation by Hasbro executives on the past, present and future of the Transformers, including a sneak preview of upcoming toys. _____I will be staying in the hotel both nights. *credit* I found this in an old usenet post. Guess I'll go ahead and link to my post regarding older cons while I'm at it. 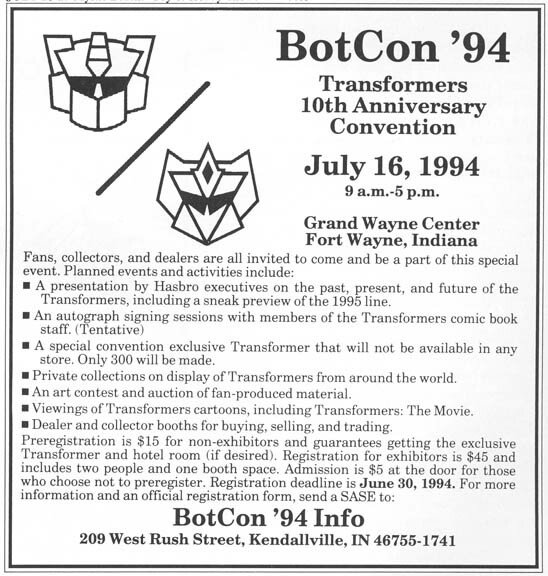 Since I'm at it, check out these scans of Tomart covering BotCon 1994. Some of the copied text didn't format well to the blogger format, so I made an attempt to clean it up so it could be easily read.